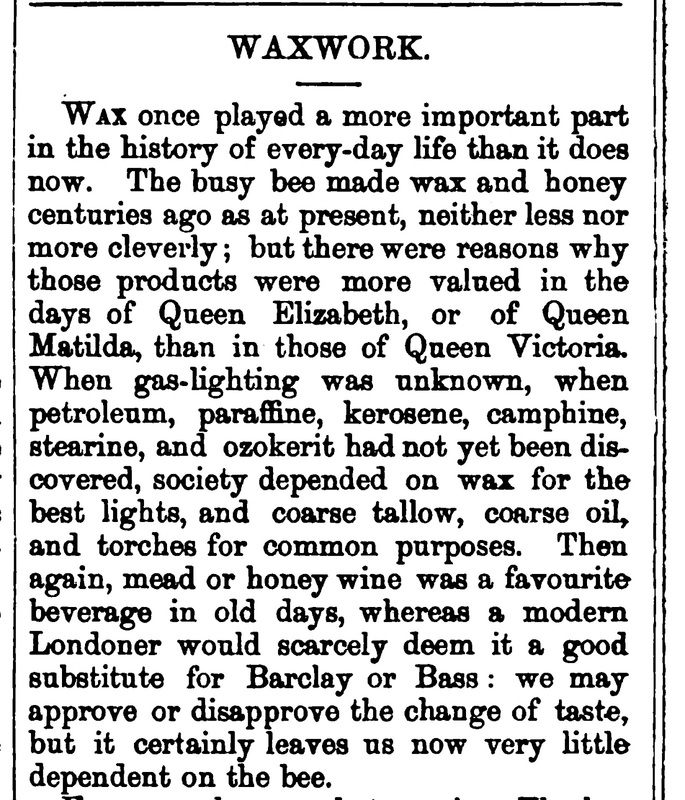 Wax once played a more important part in the history of every-day life than it does now. 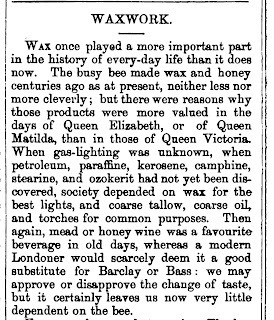 The busy bee made wax and honey centuries ago as at present, neither less nor more cleverly; but there were reasons why those products were more valued in the days of Queen Elizabeth, or of Queen Matilda, than in those of Queen Victoria. When gas-lighting was unknown, when petroleum, paraffine, kerosene, camphine, stearine, and ozokerit had not yet been discovered, society depended on wax for the best lights, and coarse tallow, coarse oil, and torches for common purposes. Then again, mead or honey wine was a favourite beverage in old days, whereas a modern Londoner would scarcely deem it a good substitute for Barclay or Bass: we may approve or disapprove the change of taste, but it certainly leaves us now very little dependent on the bee. Every one knows what wax is. The bee does not really form or originate this substance. Wax enters into the composition of the pollen of flowers, covers the envelope of the plum and other fruits, and forms a sort of varnish on the surface of many kinds of leaves. Myrtle wax is obtained from the berries of the Myrica cerifica, an American plant; when the berries are boiled in water, the wax exudes, floats on the water, is skimmed off, and remelted. The wax-palm of the Andes, the Ceroxylon Andicola, is a lofty tree yielding a mixture of wax and resin, of which the natives make candles. The wax-tree of Guiana and Brazil yields a resinous juice which is called wax, although it scarcely deserves that name. What we generally know as wax, however, is the product of the bee; whether the insect elaborates it from the pollen of flowers, or from an animal secretion, we may leave naturalists to determine. The wax is used by the bee to construct the honeycomb. When separated by pressure, melting in hot water, subsidence, and cooling, it presents itself as a softish yellow substance. By subsequent melting, stretching out into a kind of ribbon, and exposure to bleaching agents, it becomes white or bleached wax, more pure than the yellow, and having a somewhat higher melting point. In making this substance into wax candles, several prepared wicks are suspended over a vessel of melted wax, the wax is poured to a sufficient thickness on the wicks by a ladle, and the candles when cooled are made cylindrical and polished by rolling on a smooth table. Of Parys, therein that alle men kenne. Here we are told of wax candles in the chamber and Paris candles in the hall, the former probably more delicate and costly than the latter. The use of lighted wax candles in cathedrals, churches, and religious processions, and in connection with funerals, can be traced back through a long series of ages. There is an old Welsh legend to the effect that wax lights are used on the altar because bees derive their origin from Paradise, and are especially blessed by the Almighty; therefore mass ought not to be performed without the aid of the wax derived from those favoured insects. There are some indications of such a use of wax as far back as the third century; throughout the whole history of the Roman Catholic Church the usage has been maintained. There was at one time in England a due called wax-shot or wax-scot, a gift of wax candles presented to churches three times a year. What were called wax-rolls were pieces or cakes of wax, flat circular discs, presented to churches, for the use of which they were made into candles or tapers, and some other sacred things. It is known that in the Anglo-Saxon times, under Ælfric and Edgar, lights were used on the altar during mass, while others were held in the hands of attendants during the reading of the gospel; and at all times since, the gift of candles, or of wax to make them, was deemed an acceptable religious service. Several illustrations of this subject are to be met with in Mr. Toulmin Smith’s recently published work, an antiquarian book almost as pleasant as a romance. We mean the Original Ordinances of more than One Hundred Early English Gilds. There is a dispute as to whether we should say gild or guild; but this need not detain us here. Very nearly five hundred years ago, a parliament held at Cambridge in the time of Richard the Second ordered that returns should be made to the king in council as to the ordinances, usages, and properties of the English gilds. The returns seem to have been duly made and forwarded; and the original parchments on which many of them were written still remain in the Record Office, where Mr. Toulmin Smith has ferreted them out by dint of great industry and care. Wax candles, or wax to make into candles, are frequently mentioned in the records, sometimes as presentations to churches, abbeys, and convents, sometimes as forfeits or penalties. The Guild of Garlekhith (near the present Garlick-hill) had a rule that all the members should meet four times a year, on pain of forfeiting a pound of wax; and the same forfeiture was imposed on any member who neglected to attend the funeral of a brother or sister of the guild. Many of the guilds, of which this was an example, partook of the nature of our modern friendly societies, but with a marked attention to the inculcation and encouragement of piety and morality. So singularly was the purpose carried out in the Guild of St. Katherine, Aldersgate, that each brother and sister on admittance was to kiss all present, in token of love, charity, and fellowship. Five round tapers of wax, of the weight of twenty pounds, were to burn on high feast days to the honour of God, of the Virgin Mary, of St. Katherine, and all saints, and to be used to light round the body of a dead brother, and in his funeral procession. The wardens of St. Botolph’s Guild, Norwich, stated in their return that they had in hand twenty-six shillings and eightpence for the maintenance of a light. The Guild of St. George, in the same city, had in hand forty shillings for the support of a light and the making of an image. In relation to St. Katherine’s Guild, another in old Norwich, “of the chattel of the guild shall there be two candles of wax, of sixteen pounds weight, about the body of the dead,” whenever any brother or sister departed this life. The Guild of Young Scholars at Lynn was established chiefly to maintain an image of St. William, standing in a tabernacle in the church of St. Margaret, with six tapers of wax burning on festival days. The Guild of St. Elene at Beverley kept three wax lights burning every Sunday and feast day, in honour of St. Elene; while at the morning mass of Christmas Day thirteen wax lights were burned. There must have been a goodly amount of wax consumed on the Feast of the Purification by the Guild of St. Mary at Beverley; for the brethren got up a pageant, in which two youths representing angels carried a chandelier or compound candlestick, containing twenty-four thick wax lights; and the other members each carried a wax light. In the Guild of the Resurrection of our Lord, at Lincoln, at the funeral rites of a brother, thirteen wax lights were burned in four stands. In the Guild of the Fullers of Lincoln, no member was permitted to teach the craft to a learner unless the latter contributed “twopence to the wax,” that is, to the fund for buying wax lights. The Guild of Tailors, of the same city, imposed a fine of a stone of wax for infringement of one of the rules. As wax was sevenpence per pound in those days, representing a manifold higher price now, this fine was certainly a heavy one. In the Guild of St. Katherine, at Stamford, a fine of one pound of wax, plus twopence, was imposed on any member absent from the guild feast; and as the feast itself was valued at twopence per head, the absentee paid for a dinner which he did not eat, besides losing a pound of wax. On the dim alter burned continuously. And the Christmas candles, which our boys and girls still delight in, are they not relics of religious usages of old days? So far will the snow blow in afore May. A shepherd would rather see his wife on the bier. Another version, somewhat different in its philosophy, is to the effect that whatever wind blows on Candlemas Day, will continue to blow for the next forty days. Candlemas Day, our almanacks tell us, comes on the 2nd of February, and is the anniversary of the Purification of the Virgin. On this day the Church of Rome directs the blessing of candles by the clergy, the distribution of them among the people, and the carrying of the lighted candles in solemn procession. The pope presides at a great ceremonial of this kind in the chapel of the Quirinal, on Candlemas Day; and minor celebrations take place at other churches. The candle is used symbolically in reference to a passage in the Song of Simeon. Very little notice of Candlemas, or of its origin, is now taken in England, beyond a few country customs and proverbs. As far as possible removed from the use of wax as a light-giving material, is its employment as an impressionable substance, a material that can be cast into moulds when melted, and impressed with a die or seal when in a semi-molten state. The Greeks were familiar with this use of wax; they adorned their rooms with statuettes, branches, fruit, flowers, and wreaths, made of this substance. We are told that that very unrespectable gentleman, Heliogabalus, liked to tantalise his guests by setting before them dishes of waxen luxuries, so cleverly imitative of the originals as to deceive all but the initiated. Wax is largely employed in producing imitations of anatomical specimens. One of the palaces at Florence contains thirty rooms filled with coloured wax imitations of parts of the human body, and of vegetable productions. This anatomical use of wax is said to have originated as follows: Nones, of Genoa, a hospital physician, in the seventeenth century, wished to preserve a human body by embalming it; but not being able entirely to prevent putrefaction, he considered whether he could imitate the body in wax. The Abbate Zumbo, of Sicily, imitated the head so perfectly, under the direction of Nones, that many persons believed the coloured wax to be the real head; and this led to the further cultivation of the art by a Frenchman named Delacroix. Anatomical wax preparations were exhibited at Hamburg, by Courège, in 1721; and in 1737 others were publicly sold in London. Wax images and effigies have been more or less in favour for ages past. The wax effigies of the kings of England were at one time borne in procession at their funerals. There were wax effigies in Westminster Abbey, and at St. Denis, in Paris. There is a curious paper in the Tatler, by Steele, purporting to be an account of a waxwork exhibition in Germany, representing the religions of Christendom. Seven figures were placed in a row, some decked out fantastically; while behind them were other figures moved by clockwork, representing Persecution and Moderation, and so arranged as to play a kind of ecclesiastical drama. Steele describes it as having been a show carried about Germany, but names and places are not mentioned, and we are left to put our own interpretation upon it. The date would correspond very well with the time of Courège just mentioned. Mrs. Salmon’s waxwork exhibition was a famous attraction in those days. In Italy beautiful figures in wax were made by Ercole Celli, and by Giovanni and Anna Manzolini. Many fine specimens by these artists are preserved in the museums at Bologna, Turin, Paris, and St. Petersburg. Other famous Italian artists were Calzi, Phillippo, Balugani, Terrini, and Fontana, the last-named of whom employed quite a staff of anatomists, model-cutters, wax-moulders, and painters. Pinson and Laumonier in France, and Vogt in Germany, were accustomed to illustrate their anatomical lectures by means of wax casts; and the plan has since been extensively followed. Not the least celebrated among artists in wax was MadameTussaud, who, in the exercise of her art eighty years ago, lived and worked during the terrible scenes of the great French Revolution. She prepared waxen effigies of the half-savage Marat, of his murderess Charlotte Corday, of the beautiful Princess of Lamballe, of the arch-terrorist Robespierre; and was herself, on one occasion, in imminent peril of the guillotine. After many trials and struggles she settled in London early in the present century, and here she made waxen celebrities for forty or fifty years. The old lady used to sit near the entrance of her exhibition-room to receive her visitors, until at length she died, about twenty years ago, at the advanced age of ninety. 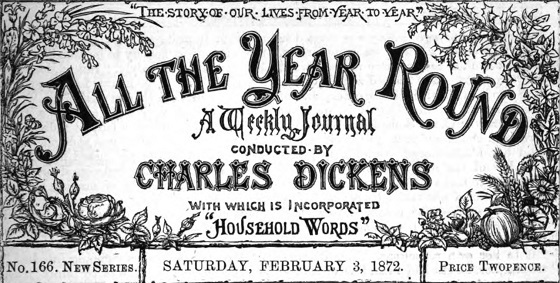 Her name is still given to the establishment over which her descendants or representatives now preside; but that is no more than we see in other cases; for who can tell us whether there is still a Day or a Martin at the blacking factory, or a Pickford at Pickford’s ? Some of the waxen effigies produced and exhibited are made by modelling, some by casting. In the former case the wax is mixed with white turpentine and lard, forming a substance easily cut and modelled with tools. In making the figures by casting, molten wax is poured into a plaster-of-paris mould; and the mould being then taken to pieces, the wax cast is easily extricated. Sculptors sometimes form their first models in a composition of wax, Burgundy pitch, and lard; it works easily, and is convenient under many circumstances. Taking an impression in wax is another mode again of using this remarkable substance. Lapidaries, gem cutters, and seal engravers often want to ascertain how their work, whether in intaglio or in cameo, is progressing; they mix some very fine wax with sugar-candy, burnt soot, and turpentine; they warm this mixture, and press the stone or gem upon it, by which a reversed copy of the device is produced. Sealing-wax of the best kind is a misnomer; it is not wax at all, being made of shellac, Venice turpentine, and cinnabar or vermilion: in the black sticks ivory black is substituted for cinnabar. The cheaper kinds are equally without wax, common resin being used instead of shellac, common turpentine instead of Venice turpentine, red lead instead of cinnabar, and lampblack instead of ivory black. How beautifully defined are the impressions carefully taken in good sealing-wax most persons know. Those who have occasion to pass through that busy hive of lawyers, law stationers, and law writers, Southampton-buildings, Chancery-lane, may once now and then see a covered cart drawn up at a particular doorway, and hundreds of bright tin boxes removed from the cart into the building to which the doorway leads. The boxes are flat and circular, larger than snuff-boxes, smaller than gentlemen’s collar-boxes, say about as large as muffins. These boxes are to contain wax seals, and they are being delivered into the Patent Office, where so much money is spent every year by inventors of new machines and new processes. In the accounts submitted annually to parliament by the Commissioners of Patents is an item of expenditure for seals for letters patent, and another item for boxes to contain the seals. Every letter patent, as the official record of a patented invention is called, is obliged to carry about with it a large yellowish seal three or four inches in diameter, enclosed in a flat circular tin box to prevent it from breaking, and fastened to the parchment by tapes or ribbons. The impression is taken in yellow wax from the Great Seal, and without this impression the patentee’s claim would be invalid. The seals here spoken of are really made of wax, though somewhat coarse in quality, mixed with Venice turpentine or some similar substance. This soft wax for legal seals was formerly used for sealing letters, until the introduction of the harder (miscalled) sealing-wax. At a time when sealing-wax was very costly in England, and before gummed envelopes were in use, an elderly lady, widow of a military officer, eked out a scanty income by begging the seals of old letters from friends and every one she knew, removing fragments, &c,, by warm water, melting the wax, and re-making it into sticks.